Update: Can You Read Smokin’ Barry’s Idi Amin Pic’s Caption? If you know the answer, I would love to know it. -W.E. I sent this to a few friends and thought I’d make a bigger thing of it, in case someone has expert technology or eyes. 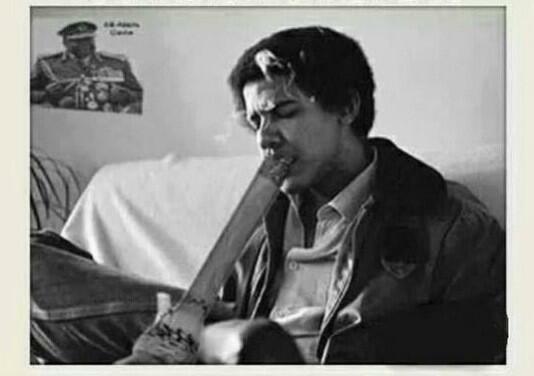 Can you or someone you know ascertain the entire caption to sadistic cannibal Idi Amin’s picture, on the wall with Drain Bamaged Barry? Of course the integrity of the image should be verified and one would like to know from whence it came, and how. And how. And is this from his Occidental College years, when he would argue for strict Leninist revolution? Or is it from when he shacked up with his fellow Muslim-to-whatever-degree, fellow apparent-foreign-national, in New York? Afterthought: we now have an “Idi Amin” tag. Took us over three years. We have arrived. But what kind of person would put that demonically, stomach-turning evil man’s picture up on the wall, whether as humor or by some more perverse motive?